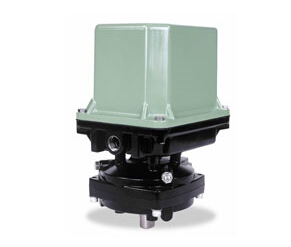 The DCR models 10 through 90 feature a declutchable manual override that disengages the actuator gearing from the motor so that the actuator cannot be operated electrically while in manual operation. AC Voltages 2 �C SPDT Switches, PTC Heater DC Voltages 2 �C SPDT (High Current) Switches. - Available in 12 or 24 VDC. Torque outputs from 250 in. / lbs to 900 in. / lbs. - Cycle times available from 2 seconds to 60 seconds. - Multi-turn versions also available. - Weather-proof or explosion proof enclosures available. AC (Single and Three Phase)Voltages 4 �C SPDT Switches, PTC Heater DC Voltages 2 �C SPDT (High Current) Switches. - Available in 12 or 24 VDC. Torque outputs from 2,000 in./lbs. to 10,000 in./lbs. - Cycle times available from 8 seconds to 60 seconds. - Combined weather-proof and explosion proof enclosures available. The MAR models 10 through 90 feature a declutchable manual override that disengages the actuator gearing from the motor so that the actuator cannot be operated electrically while in manual operation. AC Voltages 2 �C SPDT Switches, PTC Heater, DC Voltages 2 �C SPDT (High Current) Switches. - Available in 24, 120 or 220 VAC, single phase. - Torque outputs from 120 in. / lbs. to 1,000 in. / lbs. Manual override with an automatic electrical isolation switch. When the hand wheel is engaged, the electrical switch interrupts the motor from the supply voltage to prevent electrical operation. AC (Single and Three Phase)Voltages 4 �C SPDT Switches, PTC Heater DC Voltages 2 �C SPDT (High Current) Switches. - Available in 24, 120 or 220 VAC, single phase, or 230 / 460 VAC, three phase. - Torque outputs from 1,500 in. / lbs to 10,000 in./lbs. - Cycle times available from 1.25 seconds to 60 seconds. Manual override with an automatic electrical isolation switch. When the hand wheel is engaged, the electrical switch interrupts the motor from the supply voltage to prevent electrical operation. AC (Single or Three Phase)Voltages 4 �C SPDT Switches, PTC Heater, DC Voltages 2 �C SPDT (High Current) Switches. - Torque output from 21,000 in / lbs. to 48,000 in./ lbs. - Cycle times from 70 to 170 seconds. - Available in 120 or 230 VAC single phase, or 230 or 460 AC three phase voltages. - Weather-proof and explosion-proof enclosures available. AC Voltages 2 �C SPDT Switches, PTC Heater, Motor Brake. 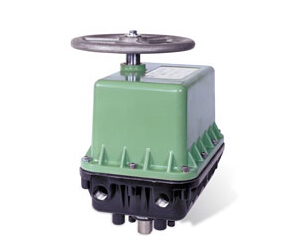 - Spring return electric actuator with 300 in./lbs. of spring-ending torque. - Clockwise or counterclockwise rotation available. - 5 or 10 Second motor cycle time, 2 second spring cycle time. - Available in 120 or 220 VAC, single phase power. 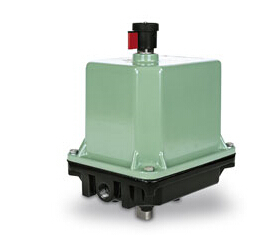 - Weather-proof or explosion proof enclosures. 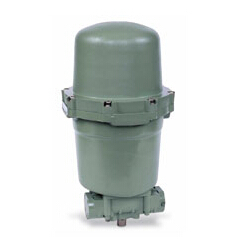 - Heavy duty motor for modulating service (SURE 25 only). AC Voltages 4 �C SPDT Switches, PTC Heater, Motor Brake DC Voltages 2 �C SPDT (High Current) Switches, PTC Heater, Motor Brake. - Electric Spring-Return Actuator with 600 in./lbs. of spring ending torque. - Clockwise or counter-clockwise rotation. - Available in 5, 15 and 30 second motor cycle time. - Spring closure time of 2 seconds. - Available in 24, 120 or 230 VAC, single phase voltage, or 12 or 24 VDC. - Weather-proof and Explosion-proof enclosure. - Suitable for on-off or modulating service. AC Voltages 4 �C SPDT Switches, PTC Heater, Motor Brake. 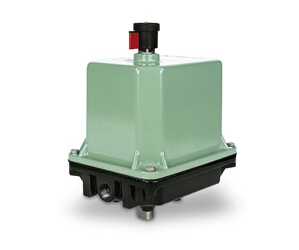 - Electric Spring-Return Actuator with 1,200 in. / lbs. of spring ending torque. - Available in 10 or 30 second motor cycle time. - Spring closure times of 5 or 7 seconds. - Available in 120 or 230 VAC single phase voltage. - Manual override option available.